Electronic Kit School. - We said again that one IC that categorize as low dropout adjustable voltage regulator is MIC2940/2941 from Micrel. Using this IC will give you high output voltage accuracy, output programmable from 1.24V to 26V with 1.25 A output, current and thermal limiting, and logic-controlled electronic shutdown. 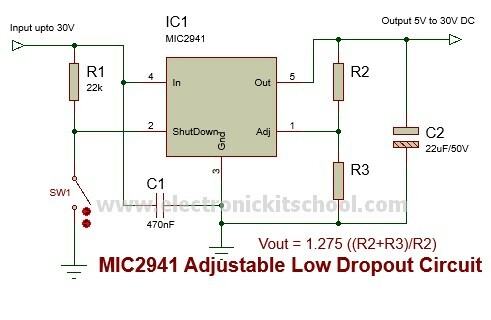 In this article we will give you one electronic circuit of 5V to 20V DC Adjustable Low Dropout Power Supply using MIC2941 IC like in Figure 1 below. The main component is used in this circuit is MIC2941 IC. Circuit like in Figure 1 above show you about the 5V to 20V DC Adjustable Low Dropout Power Supply using MIC2941 IC that give you one reference circuit to build by yourself of low dropout adjustable power supply now with input upto 30V to output 5V to 20V DC. From Circuitstoday site that LM2941 is an integrated low dropout voltage regulator IC whose output can be adjusted. The IC has many good features like thermal shutdown, transient protection, short circuit protection etc. The reverse polarity protection feature makes this IC very applicable in automotive applications. The output voltage can be adjusted from 5V to 20V and the dropout voltage is 0.5V at 1A output current. In the circuit the voltage divider network comprising of R2 and R3 sets the output voltage. Capacitor C1 is the input filter which is very essential if the regulator circuitry is situated away from the rectifier+filter module. Capacitor C2 is the output filter while SW1 is the ON/OFF switch. Resistor R1 is used to ensure the necessary 300mA pull up current which is necessary for proper shutdown when the switch SW1 is made open.